NORRISTOWN, PA—Deciding his firstborn was old enough to learn about the cultural dangers of having things in his hands, African American dad Aaron Mitchell pulled his son aside Thursday to have “the talk” about holding literally any object. “Listen, son, it’s time you learned how to conduct yourself in public. It may not make sense to you now, but you need to keep your hands empty at all times. 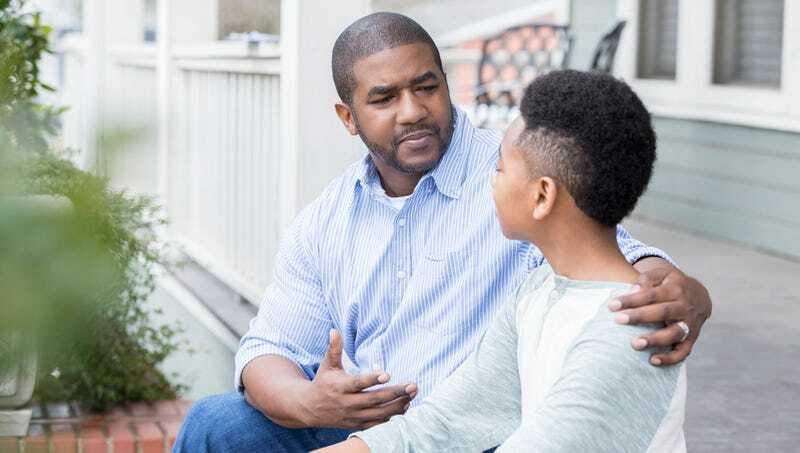 And you might not like this, but for your mother’s and my sake, keep your pockets empty, too?” Mitchell said to his 12-year-old son, Aaron Jr., adding that his father had imparted the same advice to him. “You don’t want to give the impression that you have an object on you. Matter of fact, I don’t want you hanging out with those neighbor kids who are always carrying things. I know they’re your friends, but trust me, if you get in trouble with the law, the cops can say you were a known associate of individuals known to hold things, and therefore you were holding an object by association.” At press time, Mitchell was hastily confiscating the objects strewn around his son’s bedroom.